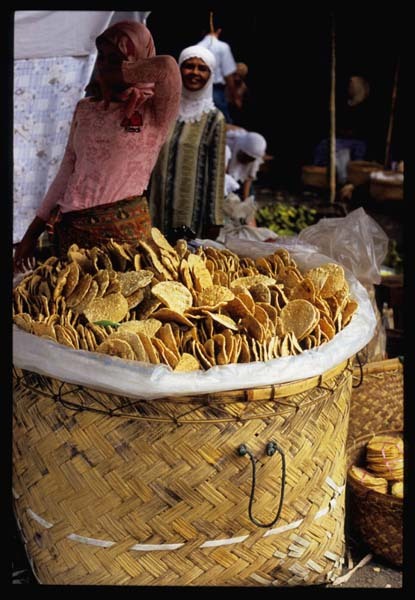 West Sumatra is home to the best crackers (or chips/crisps, if you like) in Southeast Asia. 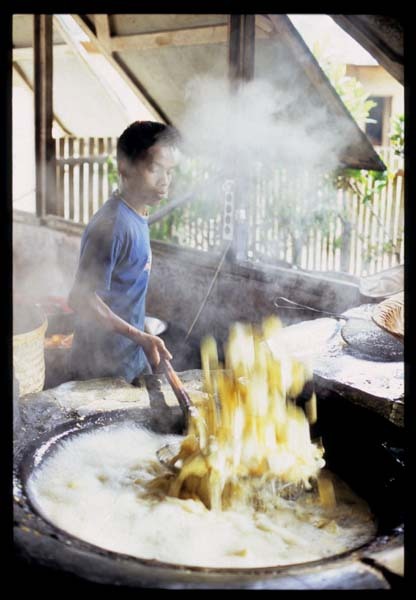 Kerepek are made all over Indonesia (and in Malaysia as well), but by our estimation Sumatra's Minangkabau take the craft of cracker making to giddy heights. Some varieties, such as peyek ikan (square or round rice flour crackers studded bits of green onions and whole dried fish), are real works of art. 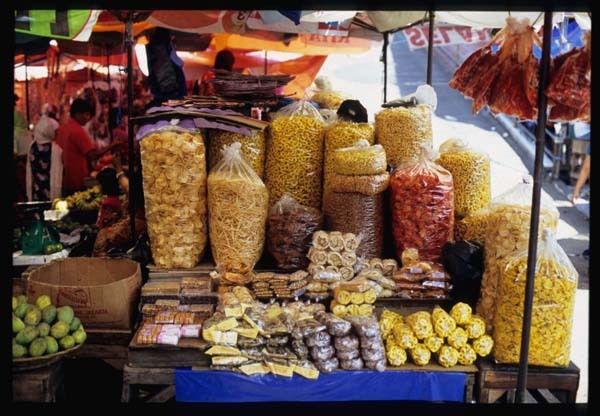 Most every west Sumatran market - big or small, daily or weekly, in town or villages - has numerous stalls dedicated to all foods crunchy and snack-able. and heaped in gargantuan baskets. and dried, awaiting a bath in hot oil to bring out their crunch. We love peyek ikan, both for its beauty and bracing, fish-forward saltiness that performs a lovely duet with ice-cold beer. 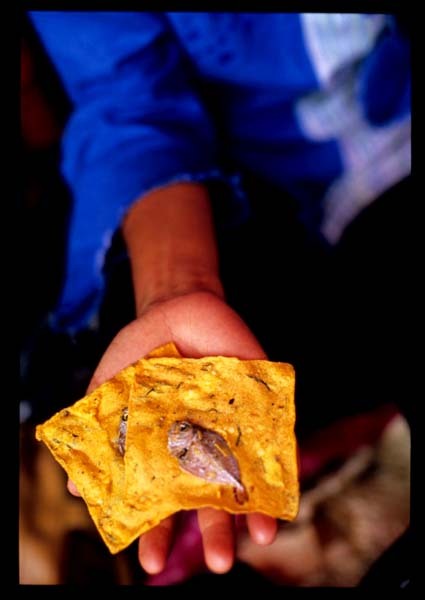 But we're especially fond of kerepek sanjai, cassava crisps with a sweet and spicy coating. 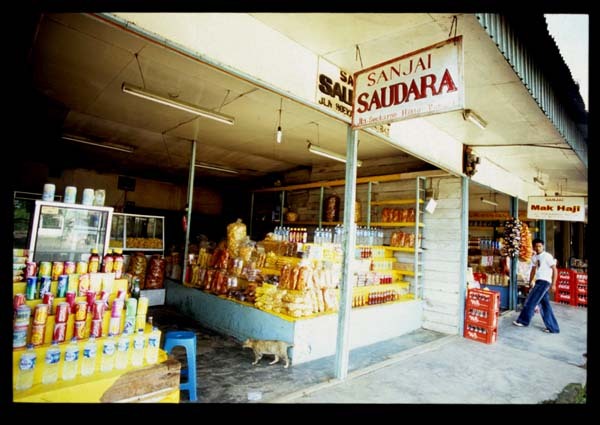 About an hour from Bukittingi, on the road to the market town of Payakumboh, two rows of shops specializing in kerepek - kerepek sanjai, in particular - face off across the two-lane blacktop. 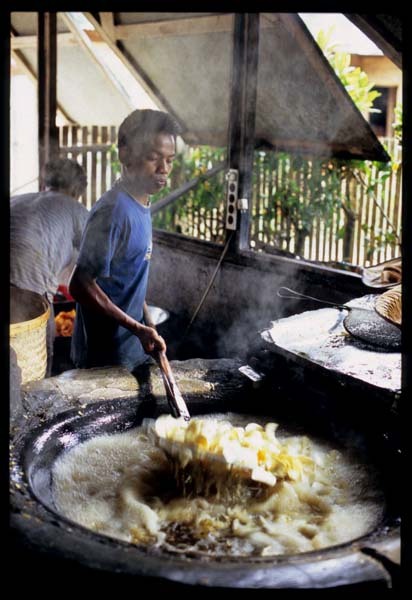 In an open room at the end of one row, two local lads are making kerepek. 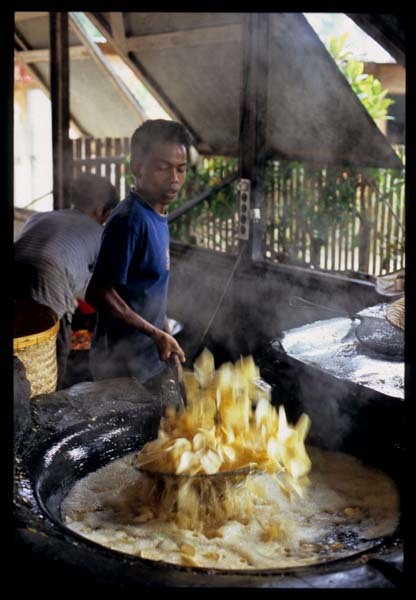 To start, a basket of wafer-thin, 2-inch wide semi sun-dried cassava strips are dumped into bubbling oil. creating lots of steam in the process. 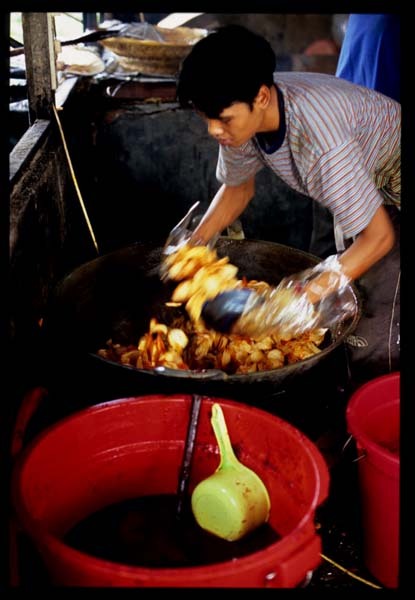 After ten minutes the kerepek are removed from the oil and transferred to a smaller wok filled with a sticky sugar-chile sauce. 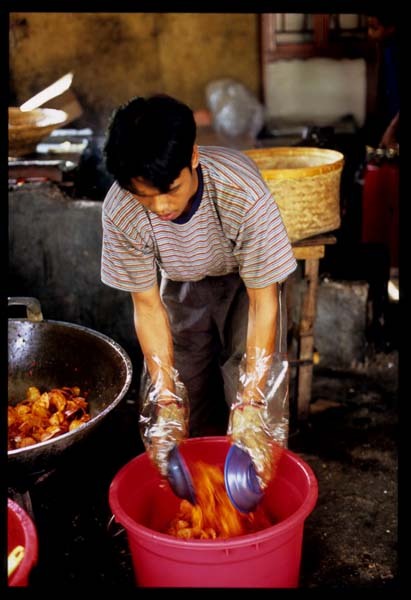 The chip mixer uses his (plastic-protected) hands and a couple of shallow plastic saucers to toss the cassava about in the brick-red goo, working quickly to make sure it coats every nook and cranny of the kerepek while they're still hot. 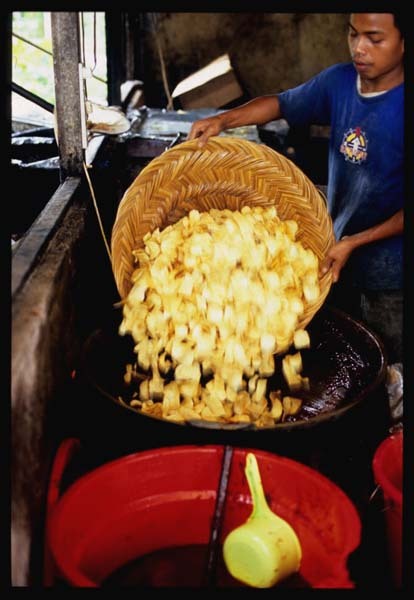 Once the kerepek have cooled, he transfers them to buckets to await packaging. 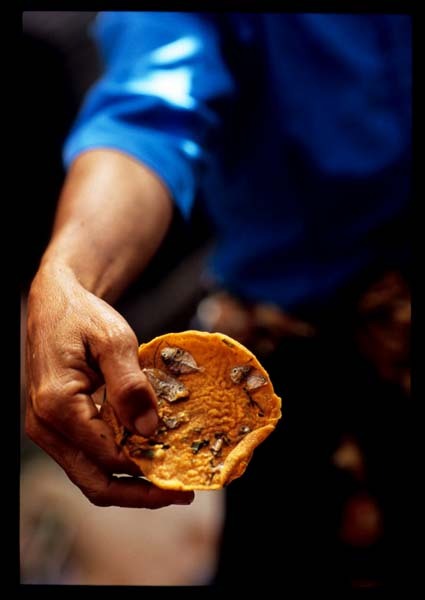 Though every shop on the strip is selling kerepek sanjai, not all use this method to prepare their specialty. 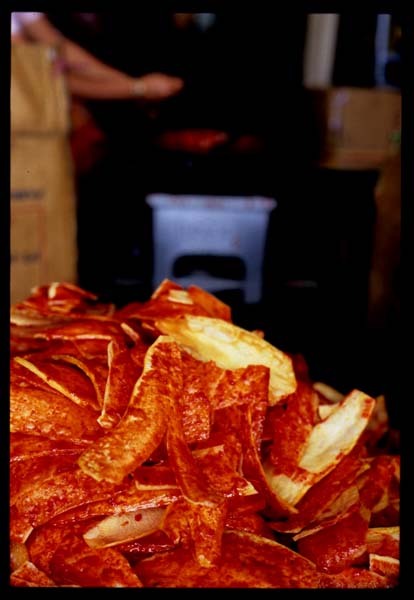 In one shop, we found a woman seated in front of a heap of cooked cassava chips, using a paint brush to painstakingly stripe both sides of each kerepek with a coating of spicy sweetness (8 photos up, background). In Padang, kerepek shops cluster near the river, in the town's Chinese section. 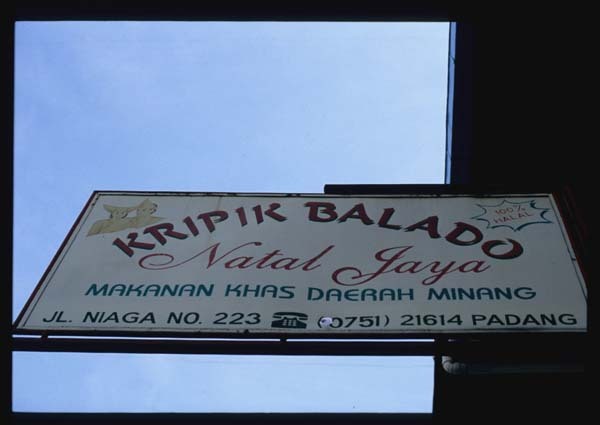 The proprietress of Natal Jaya (where peyek ikan are called payet mako, after the dried fish that decorate them, and kerepek sanjai are named kripik balado, after a Minang sambal), one of the busier businesses on the street, tells us they sell about three hundred 500-gram bags of kripik balado a day (during Ramadan the number rises to 2000). and allowed to drain. The result is a thickly-coated chip that dictates consumption be accompanied by a wetnap. 'Sticky' and 'saucy' may be words more often associated with buffalo wings than with crisps, but Natal Jaya's kerepek balado evince just the right balance of saltiness, sweetness, and lip tingling-spiciness and - in spite of their gooey-ness, have a hearty crunch that somehow stands the test of time, plastic bag packaging, and humidity. Happily, Natal Jaya will pack a carry-on luggage sized box of bags to go. Sadly, our stash ran out several months back. Great blog, Robyn. Been a fan for a while now. I love kerepek sanjai and can't get it here in Australia so have tried to make it myself unsuccessfully. Thanks for showing how it's made- will give it another go. Hi Renee - welcome! and thanks for reading. 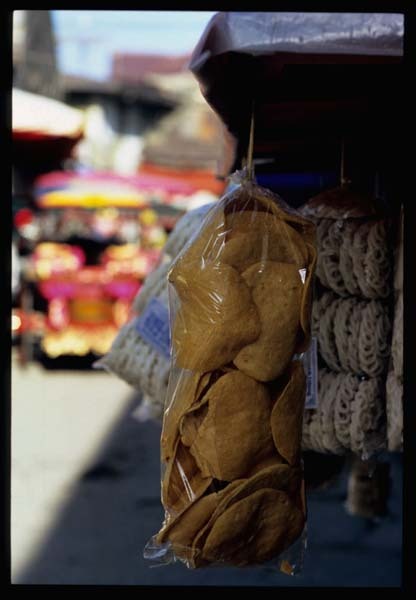 Let us know how your attempt at kripik sanjai goes. Never thought of trying to make it myself (partly bacause I'm averse to deep-frying in the home kitchen). In the Philippines, we call this KROPEK.. Interesting, blaise. Thanks for the info. 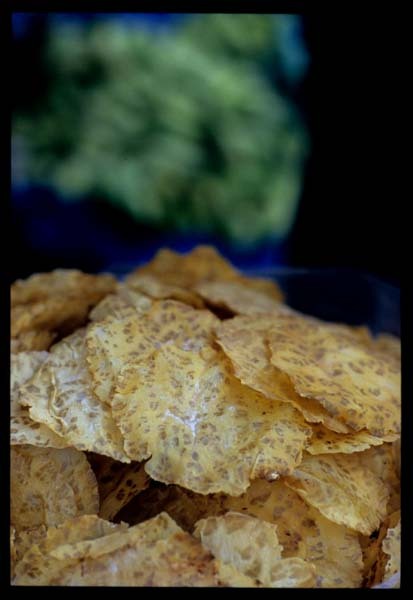 it's known as keropok in malay (malaysian). i've never tried that version of kerepek before but it should taste good. 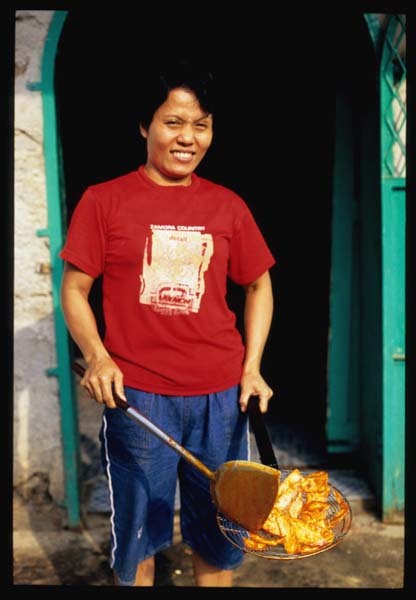 thanks for the information, it's so nice to get to witness the process of cooking the kerepek. Terra Chips, eat your heart out. I want me some of those crisps. Thank you for this post. What a saliva inducer! 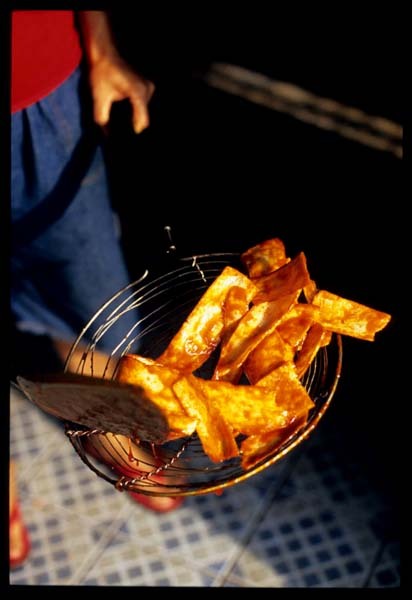 I love all kinds of chips and I do miss the ones from home (tapioca plain and covered in chilli sauce especially, and those addictive arrowroot chips). Minangkabau will be on my "to visit" list after this post. Amazing variety! Beautiful pictures, as usual. Robyn, do you go often to West Sumatra? I really enjoy your stories from Padang, Medan and other areas in Sumatra. Butet - we don't get to Sumatra as often as we like (our last trip was in Feb), but hope to get back there early next year. It's a great place for exploring, food and otherwise. You must try kerupuk Jangek. It made buffalo/cow skin or meat/lemak. For picture 1, I think very salting ... but I like it. aulihazza - thanks for yr comment. 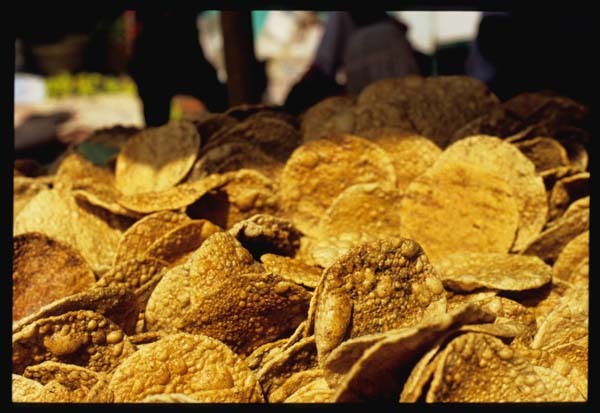 The chips in pics 5 and 6 from the top are kerupuk Jangek, in Bukittingi. They're delicious! haaa ... very different. Kerupuk Jangek from Silungkang, district Sawahlunto no like that. it is clean. Pepy - folks around Sumatra (and probably around Indonesia elsewhere, too) just seem to use different spellings. We saw 'kerepek' and 'keripik' and 'krepek' in Sumatra. They all basically sound the same when spoken. Great blog. Those chips look great, but I am not sure what is on the chip in the first two pictures. I love foodie blog. Blogs about food are the best!! !